W139 has been the beating heart of experimental art practice in Amsterdam since 1979. 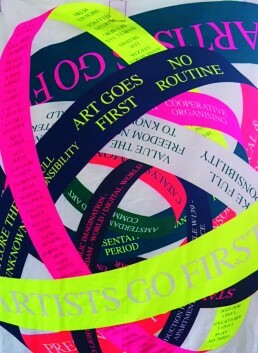 Artists Go First is a weaving of day-glow ribbons and slogans that contain instructions and processes, setting out W139’s intentions as an artist-led space: cooperative, irregular and contradictory. Activating and cultivating artistic and intellectual freedom, their message feels more urgent now than ever.